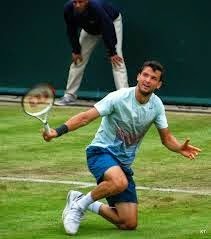 I'm not certain if Grigor ever dove from the cliffs in Bulgaria bordering the Black Sea during his youth and although Monte Carlo (his current home) is quite hilly, the terrain somewhat tapers toward the sea, so the odds are unlikely there. But, if he (somewhat) apparently chose not to launch from from the top of the cliff and chose a more sane perch at a lower altitude, this was probably a rather wise decision being that he's defending his title at the Abierto Mexicano Telcel. We know he won't take a dive in the tournament.